Fitting up to 12 PAR cans and with 6 fixing points, your lighting rig would be secure with this heavy-duty T-bar. Pulse Heavy Duty 1.5m Lighting T-Bar (Pair). PA & Live Sound. Secured by Locking Screw. 2x Novopro PS1XL-SW Spare White Scrim for PS1XL DJ Disco Podium Lighting Stand. Laser cut base plate is 600mm x 600mm x 6mm with 10mm dia holes at each corner to bolt down if required, slotted carry handle and open slot enabling them to be stacked if buying more than one and therefore taking up less storage space. 2x Gravity Heavy Duty Lighting Stands inc. 2x Gravity LS331 Lighting Stands. Type: Lighting Stands. The bag is made from tough 600D nylon that is water repellent and easy to clean. 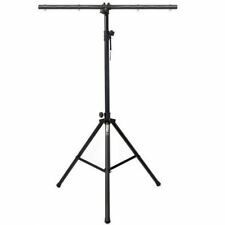 The LS331B lighting stand features a large heavy steel base providing a firm footing and a single extension for a maximum height of 2.4 m.
With mounting hole (d=28mm) for tv-pin. Maximum load: 18 kg. height: 2.10 m. height: 1.35 m. Weight 6.90 kg. Karaoke Systems. DJ LIGHTING. Lighting Stand Adaptor (35 mm) DJ DISCO KARAOKE. A high quality, sturdy lighting bridge ideal for most venues. The lighting bridge features a 3 m span and maximum height of 2.8 m. Made from steel and finished in black, the lighting bridge has a maximum load of 50 kg. Height adjustable light bar for DJ stand DS40. Fits the Equinox DJ Booth (MKII). load: 50 kg. Weight Not Specified. 1570 – 2700 x 2555 mm. Light aluminium crossbeam. Product type: Stands and Tripod Accessories. Material: die-cast aluminium. Fitting: 36 mm clamp. load capacity: 50 kg. Weight 1.7 kg. Type: Lighting Stands. Colour: Black. Gravity LS TB 01 Black Aluminium Lighting T Bar Crossbeam for Stand 35mm Thread. Canary Islands. Bosnia & Herzegovina. San Marino. Czech Republic. 152mm x 89mm x 127mm. Size: 6in x 3.5in x 5in. Weight: 1.5lbs (0.6kg). Fits: 1in, 1.5in, 2in truss. 4 x Black 25mm Hook G Clamp. load WLL (4-fold): 20 kg. load BGV C1 (8-fold): 10 kg. load BGV C1 (10-fold): 8 kg. load BGV C1 (12-fold): 7 kg. Hook for installing projectors, lighting effects etc. via a truss system. A single point mounting adaptor enabling you to fix a lighting effect, PA horn or special effects unit (such as a bubble or snow machine) to a 35mm speaker stand. M8 Thread and wing nut for attaching light or FX unit. 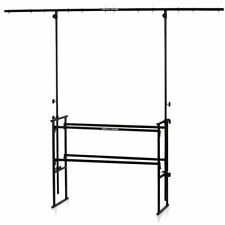 Athletic Lighting T Bar 1M Length. Weight 1,2kg. A 1000mm lighting beam allowing to mount up to 4 lighting outlets; to be mounted on lighting stands. Width 1000mm. QTX Triangle lighting truss system - 3m NEW. QTX Speaker Stand Kit 2pcs Steel NEW. QTX Black light fluorescent tube, standard, 1200mm, 36W NEW. DJ LIGHTING. NJS ABS Rack Case (Rack Size 10U). weight load 50kg. 2x Equinox 32mm Lighting Stand Adaptor. Supplied with M10 bolt, spring and plain washers. 40kg maximum load (evenly distributed). Rugged, machined aluminium construction. 0.024 kg (single unit). Add to Favourites. Backdrop Curtains (11). Backdrop Stands (19). 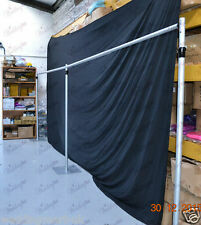 6Mx3M Wedding Backdrop Curtain. 3Mx3M White Wedding Backdrop Curtain with Detachable Swag. 6Mx3M White Wedding Backdrop Curtain with Detachable Swag. 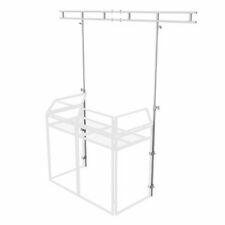 6Mx3M Heavy Duty Backdrop Stands. Max load: 25kg. - This low cost, Black tripod stand is ideal for hanging several types of par cans or pin spots. - Weight: 5 kg. Sturdy truss light bridge for up to 16 light effects. 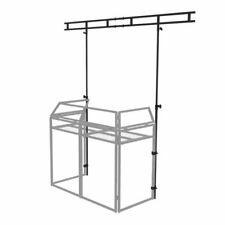 Main Features Supplied with safety pins for height adjustment Truss bar with pre-drilled mounting holes Stable tripod with locking system Max. weight load:100kg. 2x Gravity LS TB 01 Black Aluminium Lighting Crossbeam T-Bar for DJ Stand (35mm). To keep your equipment organized and safe, it's important to have the right lighting stand. It can keep both your musical and visual props together for you to have a successful set. eBay is now offering these stands for sale online at affordable prices. 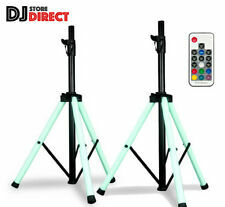 What are some features of DJ lighting stands? 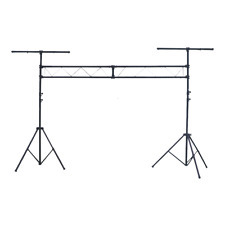 High load capacity: Most DJ lighting stands can hold up to 10kg. Strong rubber feet: Most DJ lighting stands also feature strong rubber feet for support of the stand. Stainless-steel stands: Stainless steel makes the stands more durable. Butterfly nuts: Butterfly nuts help to reinforce tightness. What equipment can DJ lighting stands support? 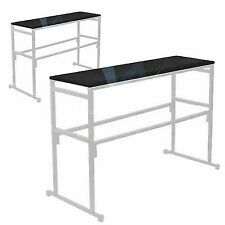 These stands can support numerous types of equipment for a DJ's set. It can hold different types of lights, such as the halogen and LED lights that are often used during a set in a nightclub. When made of stainless-steel material, they can support the weight of the types of aforementioned lights for lengthy periods of time. The overall structure of the stands also helps when supporting cables are needed to connect to lights and different speakers. Their thin shape makes it easy for cables to wrap around or to go through them (if the stand has small holes) to connect them to the lighting equipment. What types of DJ lighting stands are available for use? Tripod: A tripod is one of the most common types of stands. It is mounted by three different legs and kept together by nuts. On tripods, you can fit smaller, more compact objects that can be fit on the top of the tripod. Totem: A totem is a tall stand with a wide base that can either support wired lighting or bigger lights that fit the mold of the stand. Totems are often used for lights like strobe lights, but they can also be part of an overall effect that includes a scrim cover. With a scrim cover, you can place it over a totem that is handling lights to create a blanketed lighting effect. Laser mounts: There are also laser mounts for supporting small laser lights. They are usually shaped like a computer model that fits the lasers in the middle of the structure.